Teppo Kröger is Professor of Social and Public Policy at the Department of Social Sciences and Philosophy of the University of Jyväskylä. He leads the Centre of Excellence in Research on Ageing and Care (CoE AgeCare) and co-ordinates the Research Group on Care Policy (CARPO). He has led and participated in many Nordic, European and global research projects and networks and made research visits to universities in Australia, Britain, Italy, Japan, Sweden and Taiwan. Teppo Kröger's primary research focus is on care policy seen from local, comparative and global perspectives, and his studies have analysed, for example, long-term care for older people, reconciliation of work and care, integration of formal and informal care, conditions of care work and childcare policy. In his research, he aims to integrate different theoretical and empirical approaches of social policy, disability studies, social gerontology, family sociology and governance studies. He has drafted new conceptual perspectives for the analysis of care policy, including the concepts of welfare municipality, weak universalism, dedomestication, demographic panic, care capital and care poverty. 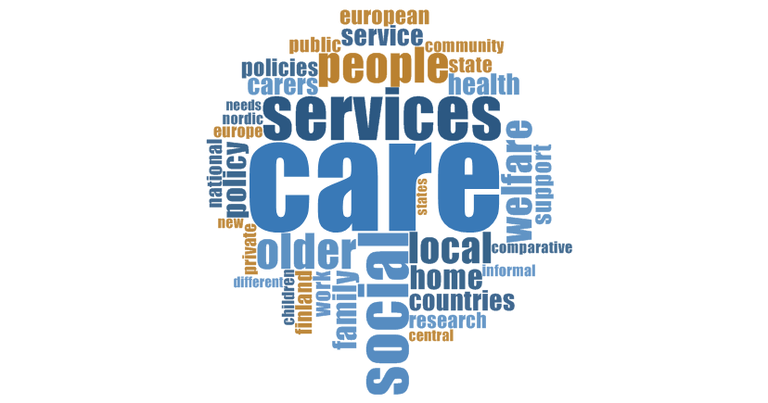 the SOCCARE Project (‘New Kinds of Families, New Kinds of Social Care’, funded by EU FP5 2000–2003). Network of Excellence ‘Reconciling Work and Welfare in Europe’ (RECWOWE) (co-ordinated by Maison des Sciences de l’Homme Ange Guépin – Nantes, funded by EU FP6 2006–2011). Teppo Kröger supervises master and doctoral theses that analyse social policies of ageing, care, disability, family and childhood. At the moment, he is supervising the following PhD students: Mari Aholainen, Tuulikki Alanko, Ulla Halonen, Matti Kajaste, Sher E. Khoda, Youngbin Kwon, Emilia Leinonen, Salla Manninen, Jiby Mathew Puthenparambil, Tiina Sihto, Paula Vasara and Liliya Zenina. His students have been awarded for the Best PhD Thesis of the University of Jyvaskylä (Helena Hirvonen, 2014) and the Best Master Thesis in Social Policy in Finland (Emilia Leinonen, 2014). Teppo Kröger has evaluated applicants for Professor and Lecturer positions in Australia, Estonia, Finland, Iceland, Norway and the United Kingdom as well as research proposals in Denmark, Finland, Hong Kong, Hungary, the Netherlands, Sweden and for the European Research Council (ERC Advanced Grants) and the Open Research Area for the Social Sciences (ORA). He has been a pre-examiner and faculty opponent of PhD theses in Finnish, Norwegian and Swedish universities. He is a member of editorial boards of the International Journal of Care and Caring, the Nordic Journal of Social Research and the Social Work & Social Sciences Review. He has served as a referee for 30 different academic journals and as an external expert for the European Network of Experts on Gender Equality (ENEGE) and the European Association of Service Providers for Persons with Disabilities (EASPD). He is currently the representative of Finland in the Academic Network of European Disability Experts (ANED) and a Humanities and Social Sciences Panel Member of the Swedish Research Council (international postdoc programme). He is a board member of the Social Policy Association in Finland since 2012. As well, he is a founding member and a board (vice) member of the Finnish Society for Disability Research since 2006. Teppo Kröger's research produces knowledge on the different ways support and care for children, disabled persons and older people can be organised and on the manifold outcomes these solutions have for various areas of the society (e.g. labour markets, well-being, equality, gender and generational relations). This knowledge is relevant for policy-makers, NGOs, user organisations, labour unions and other actors of the care policy scene. Kröger, Teppo (2019) Looking for the Easy Way Out: Demographic Panic and the Twists and Turns of Long-term Care Policy in Finland. In Jing, Tian-kui, Kuhnle, Stein, Pan, Yi & Chen, Sheying (eds.) Aging Welfare and Social Policy: China and the Nordic Countries in Comparative Perspective. Cham: Springer, 91–104. Chou, Yueh-Ching, Kröger, Teppo & Pu, Cheng-Yun (2018) Underemployment among Mothers of Children with Intellectual Disabilities. Journal of Applied Research in Intellectual Disabilities 31 (1), 152–158. Kröger, Teppo & Bagnato, Angela (2017) Care for Older People in Early Twenty-first Century Europe: Dimensions and Directions of Change. In Martinelli, Flavia, Anttonen, Anneli & Mätzke, Margitta (eds.) Social Services Disrupted: Changes, Challenges and Policy Implications for Europe in Times of Austerity. Cheltenham: Edward Elgar, 201–218. Mathew Puthenparambil, Jiby, Kröger, Teppo & Van Aerschot, Lina (2017) Users of Care Services in a Nordic Welfare State under Marketisation: The Rich, the Poor and the Sick. Health and Social Care in the Community 25 (1), 54–64. Chou, Yueh-Ching & Kröger, Teppo (2017) Application of the International Classification of Functioning, Disability and Health in Taiwan: Victory of the Medical Model. Disability & Society 32 (7), 1043–1064. Chou, Yueh-Ching, Pfau-Effinger, Birgit, Kröger, Teppo & Ranci, Costanzo (2017) Impact of Care Responsibilities on Women’s Employment : A Comparison between European and East Asian Welfare States. European Societies 19 (2), 157–177. Mathew Puthenparambil, Jiby & Kröger, Teppo (2016) Using Private Social Care Services in Finland: Free or Forced Choices for Older People? Journal of Social Services Research 42 (2), 167–179. Chou, Yueh-Ching, Kröger, Teppo & Pu, Cheng-yun (2016) Universal Breadwinner vs. Universal Caregiver Model: Fathers’ Involvement in Caregiving and Well-being of Mothers of Offspring with Intellectual Disabilities. Journal of Applied Research in Intellectual Disabilities 29 (1), 34–45. Kuronen, Marjo, Kröger, Teppo, Alonso, Fernando Antón, Cucca, Roberta, Escobedo, Anna, Jensen, Per & Sabatinelli, Stefania (2015) The Relationships between Local and National Childcare Policies: A Comparison of Nordic and Southern European Cities. In Kutsar, Dagmar & Kuronen, Marjo (eds.) Local Welfare Policy Making in European Cities. Cham: Springer, 119–134. Chou, Yueh-Ching & Kröger, Teppo & Pu, Cheng-yun (2015) Models of Long-term Care Use among Older People with Disabilities in Taiwan: Institutional Care, Community Care, Live-in Migrant Care and Family Care. European Journal of Ageing 12 (2), 95–104. Chou, Yueh-Ching & Kröger, Teppo (2014) Reconciliation of Work and Care among Lone Mothers of Adults with Intellectual Disabilities: The Role and Limits of Care Capital. Health and Social Care in the Community 22 (4), 439–448. Kröger, Teppo & Yeandle, Sue (eds.) (2013) Combining Paid Work and Family Care: Policies and Experiences in International Perspective. Bristol: Policy Press. Kröger, Teppo & Yeandle, Sue (2013) Reconciling Work and Care: An International Analysis. In Kröger, Teppo & Yeandle, Sue (eds.) Combining Paid Work and Family Care: Policies and Experiences in International Perspective. Bristol: Policy Press, 3–22. Yeandle, Sue & Kröger, Teppo with Cass, Bettina, Chou, Yueh-Ching, Shimmei, Masaya and Szebehely, Marta (2013) The Emergence of Policy Supporting Working Carers: Developments in Six Countries. In Kröger, Teppo & Yeandle, Sue (eds.) Combining Paid Work and Family Care: Policies and Experiences in International Perspective. Bristol: Policy Press, 23–50. Yeandle, Sue & Kröger, Teppo (2013) Reconciling Work and Care for Older Parents, Disabled Children and Partners: Convergent or Separate Paths in Three Welfare Systems? In Kröger, Teppo & Yeandle, Sue (eds.) Combining Paid Work and Family Care: Policies and Experiences in International Perspective. Bristol: Policy Press, 219–239. Chou, Yueh-Ching, Kröger, Teppo, Chiao, Chi & Pu, Cheng-yun (2013) Well-being among Employed and Non-employed Caregiving Women in Taiwan. International Journal of Social Welfare 22 (2), 164–174. Yeandle, Sue, Kröger, Teppo & Cass, Bettina (2012) Voice and Choice for Users and Carers? Developments in Patterns of Care for Older People in Australia, England and Finland. Journal of European Social Policy 22 (4), 432–445. Kröger, Teppo & Leinonen, Anu (2012) Transformation by Stealth: The Retargeting of Home Care Services in Finland. Health and Social Care in the Community 20 (3), 319–327. Kröger, Teppo & Leinonen, Anu (2011) Home Care in Finland. In Rostgaard, Tine et al. : Living Independently at Home: Reforms in Home Care in 9 European Countries. Copenhagen: SFI – The Danish National Centre for Social Research, 117–138. Kröger, Teppo (2011) Defamilisation, Dedomestication and Care Policy: Comparing Childcare Service Provisions of Welfare States. International Journal of Sociology and Social Policy 31 (7/8), 424–440. Kröger, Teppo (2011) The Adoption of Market-Based Practices within Care for Older People: Is the Work Satisfaction of Nordic Care Workers at Risk? Nordic Journal of Social Research 2 (1), 91–103. Kröger, Teppo (2011) Retuning the Nordic Welfare Municipality: Central Regulation of Social Care under Change in Finland. International Journal of Sociology and Social Policy 31 (3/4), 148–159. Kröger, Teppo (2011) Under Tension: Formal Care Work with Older People. In Pfau-Effinger, Birgit & Rostgaard, Tine (eds.) Care between Work and Welfare in European Societies. Basingstoke: Palgrave Macmillan, 115–128. Chou, Yueh-Ching, Fu, Li-yeh, Kröger, Teppo & Chiu, Ru-yan (2011) Job Satisfaction and Quality of Life among Home Care Workers: A Comparison of Home Care Workers Who Are and Who Are Not Informal Carers. International Psychogeriatrics 23 (5), 814–825. Kröger, Teppo (2010) Lone Mothers and the Puzzles of Daily Life: Do Care Regimes Really Matter? International Journal of Social Welfare 19 (4), 390–401. Forsberg, Hannele & Kröger, Teppo (eds.) (2010) Social Work and Child Welfare Politics: Through Nordic Lenses. Bristol: Policy Press. Eydal, Guðný Björk & Kröger, Teppo (2010) Nordic Family Policies: Constructing Contexts for Social Work with Families. In Forsberg, Hannele & Kröger, Teppo (eds.) Social Work and Child Welfare Politics through Nordic Lenses. Bristol: Policy Press, 11–27. Chou, Yueh-Ching & Pu, Cheng-Yun & Fu, Li-yeh & Kröger, Teppo (2010) Depressive Symptoms in Older Female Carers of Adults with Intellectual Disabilities. Journal of Intellectual Disability Research 54 (12), 1031–1044. Chou, Yueh-Ching & Pu, Cheng-Yun & Kröger, Teppo & Fu, Li-yeh (2010) Caring, Employment and Quality of Life: Comparison of Employed and Nonemployed Mothers of Adults with Intellectual Disability. American Journal on Intellectual and Developmental Disabilities 115 (5), 406–420. Chou, Yueh-Ching & Kröger, Teppo & Lee, Yue-Chune (2010) Predictors of Job Satisfaction among Staff in Residential Settings for Persons with Intellectual Disabilities. Journal of Applied Research in Intellectual Disabilities 23 (3), 279–289.